The killing of nine people at the Emanuel African Methodist Episcopal Church in Charleston, South Carolina is just the latest in a long list of attacks targeting Black Churches in the United States. After the American Civil War, African-Americans, mostly former slaves, abandoned the White controlled churches in which they had been forced to worship. They began to pray, sing, and - for the first time - legally learn to read the Bible, gathering in any makeshift structure they could find. These post Emancipation churches became the first social institutions in America completely controlled by African Americans. And Whites, also identifying themselves as "Christians," were not happy. Their attacks on Black churches killed hundreds of people and burned small churches throughout the South. In 1870, nearly every Black church in Tuskegee, Alabama was burned to the ground by Whites attempting to subjugate the newly freed Black population. 93 years later the bombs continued to explode at a well known Black church in Birmingham, Alabama which had become an established meeting place for the Civil Rights movement. Four young Black girls were killed. Heidi Beirich, of the Southern Poverty Law Center, explains the significance of continued violence against Black churches in many American communities. "If you want to harm Black folks, it's an obvious easy target," she said. The evidence is clear. Throughout the 1960's, over 300 bombings occurred at Black churches, according to a 1999 study in The Journal of Ethnic and Racial Studies. The study also uncovered 200 similar church bombings between 1989 - 1996. Deval Patrick, who was an Assistant Attorney General for the US Department of Justice in 1997, stated, "We are facing an epidemic of terror." 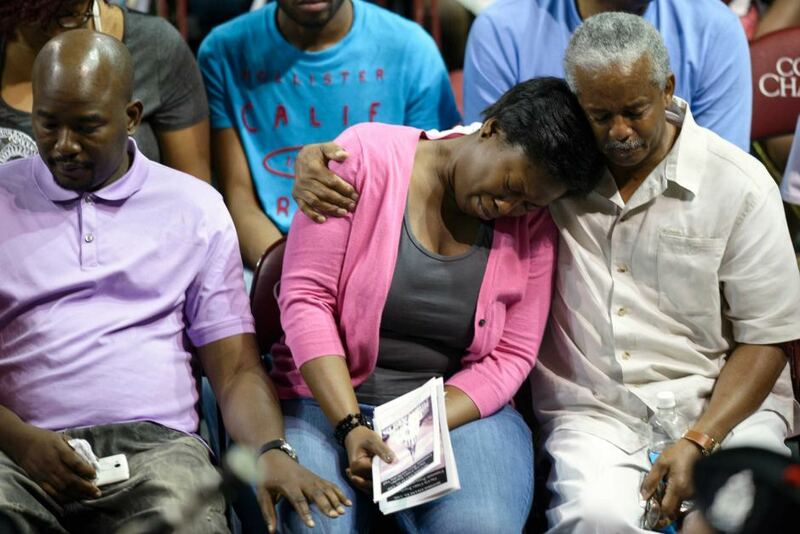 The nine murders in Charleston are the latest symptom in this epidemic. "This is an example of how terrorism works," said Barbara D. Savage, a professor at the University of Pennsylvania and the author of "Your Spirits Walk Beside Us: The Politics of Black Religion." She went on to explain how this week's attack has spread justifiable fear in the Black Christian community, "In churches all over the country people are asking, 'Do we need someone at the door, someone who is a little bit more questioning?' "
This is where White pastors and churches could truly help, but from a look at their history, they won't. Tomorrow morning, Sunday, June 21, 2015, African Americans will gather in churches all over the United States - and they will gather in fear. While this should be the safest and most sacred moment of their week, it has become another reminder that they are set apart as targets. And the response of White pastors and churches? Mostly postings on social media pertaining to how liberals will use this incident for gun control legislation. "Gun control advocates never give their true position - the elimination of all private gun ownership - their arguments never make common sense," was the Facebook and Twitter response from Pastor Will Marotti, of New Life Church in Wallingford, Connecticut. His comments came 24 hours after Dylann Roof killed nine people in Charleston, reloading his gun five times. That anyone - let alone a White Christian Pastor - would be worried about protecting his guns just one day after nine people were murdered in a Black church is deplorable. What should White churches and pastors be worried about as Sunday approaches? The answer is simple: Black churches. Right now, Black congregations are scared of going to church tomorrow morning. Yet, are any White pastors or church leaders reaching out to them in any way? Are they offering help? Are they asking what they can do to stand by their Christian brothers and sisters - often at a church just across the street - to help alleviate their fears? Are they just picking up the phone and checking in to discover if there is anything at all they can do after this terrible week? Making that one, powerful phone call would take a special kind of faith and courage from White pastors and churches. As we have witnessed in the past few days, active faith and courage are not characteristics they often demonstrate. Instead, they have chosen to simply ignore the ongoing history of violence against the Black members of their fellowship. So tomorrow, White pastors and church members will casually walk into weekly worship services, concerned only with their rights as gun owners. While a short distance away, African Americans will go to church wondering if they will come out alive.